(Bloomberg) -- Investors hoping for even more gains from Chinese equities have reasons to stay optimistic. Even after a 30 percent surge in the Shanghai Composite Index this year, stimulus from the Chinese government is keeping the bulls going. Authorities will support fundraising of the nation’s small and medium-sized companies via more channels including capital markets, state-run CCTV reported over the weekend. That came after last week’s improving factory activity gave investors confidence that the measures are working, with progress on the trade front also helping sentiment. On trade, Larry Kudlow, the top economic adviser to President Donald Trump, said the U.S. and China are “closer and closer” to a deal, and top officials will continue talks this week via teleconference. Kudlow expressed “guarded optimism, maybe more than guarded optimism” in a Sunday appearance on CBS’s “Face the Nation,” after China’s state-run Xinhua news agency also reported progress during the discussions in Washington that ended Friday. While Chinese shares are still about 9 percent away from last year’s high -- unlike the S&P 500 Index, which on Friday came within striking distance of its peak from September -- they are the world’s best performers this year. 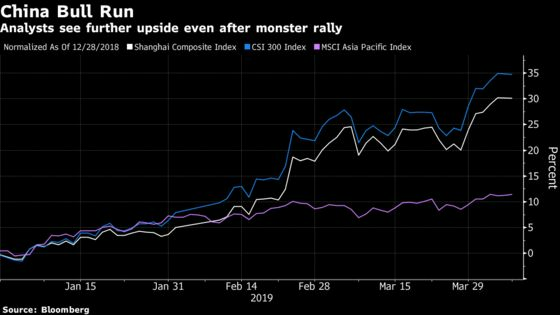 The CSI 300 Index of the top stocks in Shanghai and Shenzhen has climbed even more this year, up 35 percent. Zweifel estimates Beijing’s accelerated reforms and stimulus measures, including tax cuts, infrastructure spending and monetary easing, are worth some 2.8 trillion yuan ($417 billion), with about a third of that filtering through to the economic expansion. That said, some investors are on alert for signs the market is overextended. Consider this: The Shanghai Composite rallied 8.4 percent in the five days ended Thursday. It erased gains of as much as 1.3 percent on Monday as it reopened after a holiday Friday.